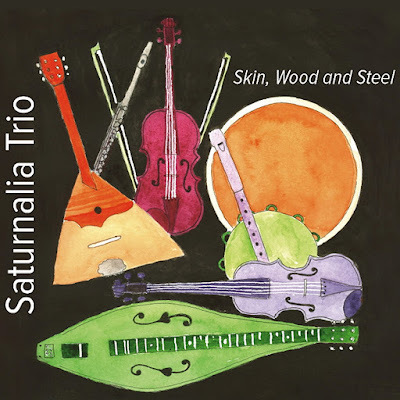 The first Saturnalia Trio album since 2009's "Hummingbirds" was released on Tuesday, August 11th on iTunes, Amazon, et al. Recorded this past winter/spring, "Skin, Wood and Steel" features mostly Medieval and Renaissance tunes and original tunes in the style of historic Medieval dance tunes - sprinkled with a few original songs and a cover of The Beatles "Norwegian Wood". English publication fROOTS said "Pleasant, undemanding, yet curiously uplifting Medieval and modern tunes sounding at times like Robin Williamson’s Merry Band or the soundtracks to Robin of Sherwood or Merlin." This album is available as a limited run CD and is downloadable from Band Camp. You can also order from CD Baby and Amazon. Read a review here. Daniel Crommie: vocals, six-string dulcimer, flute, recorders, balalaika, whistles, cornamuse, bul bul tarang, jaw trump, aux percussion, electric dulcimer. Leslie Gray: violin & viola. Michael Treadwell: bodhran, tombec, frame drums, glockenspiel. Jamie Haggerty: hurdy gurdy, glockenspiel and percussion.